Connect the iStomp to an iOS 6.0+ device using the DigiTech Smart Cable. 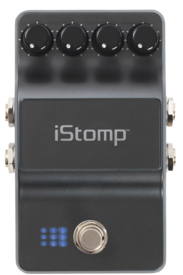 In about the same time it takes to download a song, you can completely reconfigure the iStomp with any e-pedal from your virtual road case using the Stomp Shop app. Disconnect the Smart Cable and you’re ready to use your iStomp just like you would any traditional pedal.